I have been working with the collage to find if I can portray the familiar in the abstract. when I create these works, in the back of my mind I use an image of the antique wood fence that was once located in the center of a small town. This fence was used for public notices, traveling road shows, the circus or snake oil advertisements. After the event was over, the old poster was partially torn off or over-painted and a new event advertisement was slapped up over the old one. Over time, this site becomes a time capsule of the events of this small town and the lives of the people. The remnants of memories of these past events will elicit individual emotions and experiences. 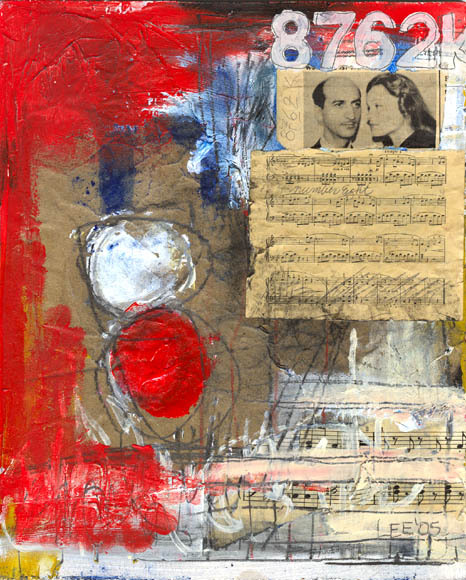 In my collage paintings I use vintage music, literature and photos in a visually abstract style in an attempt to have the observer relate to the work on an emotional and visual level, and possibly elicit a forgotten memory. from Cedar Rapids, IA, USA.